Did you know there is a scarlet thread woven all through the pages of God's Word from Genesis to Revelation-telling the incredible story of all that Jesus would do and has done for us? And what He is preparing for us in eternity? 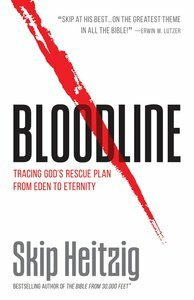 In Bloodline, Pastor Skip Heitzig invites you on a journey that follows this thread-a journey through every book of the Bible, from the beginning to the end. This is the bloodline of redemption. Trace it&...and you will experience Jesus's great love for you as never before.